The electric rearview mirror automatically controls the glare from the headlights of the vehicles behind you in nighttime or low light driving conditions. The sensor (3) mounted in the mirror senses the light level around the vehicle, and automatically controls the headlight glare from the vehicles behind you. When the engine is running, the glare is automatically controlled by the sensor mounted in the rearview mirror. 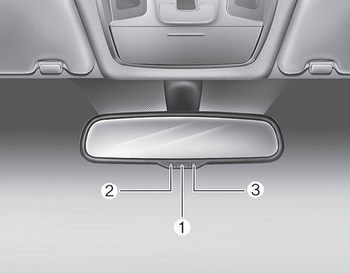 Whenever the shift lever is shifted into reverse (R), the mirror will automatically go to the brightest setting in order to improve the drivers view behind the vehicle. When cleaning the mirror, use a paper towel or similar material dampened with glass cleaner. Do not spray glass cleaner directly on the mirror. It may cause the liquid cleaner to enter the mirror housing. Press the ON/OFF button (1) to turn the automatic dimming function off. The mirror indicator light (2) will turn off. Press the ON/OFF button (1) to turn the automatic dimming function on. The mirror indicator light (2) will illuminate.